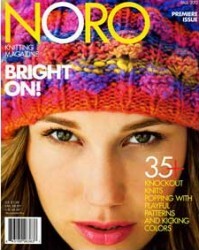 35 garments and accessories using a variety of wonderful Noro yarns. Try the first ever issue! Includes a behind-the-scenes article looking at the manufacture and colour blending techniques used in making the yarns, with Cornelia Tuttle Hamilton. Patterns include fantastic garments, wonderful accessories and ideas for the home. I love the felted knitting tote and the felted stacking storage bowls. There's also a very wearable man's jumper and couple of hats.